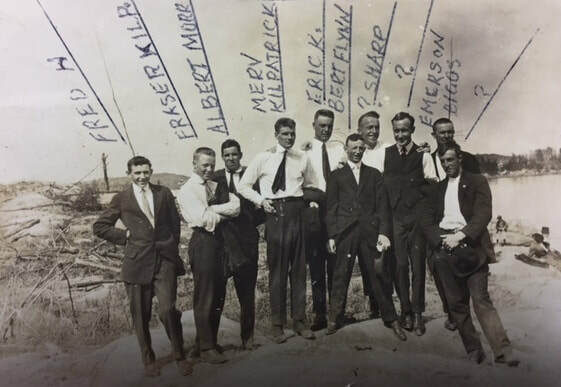 Young men from Copper Cliff enlisted to fight for King and country in World War I. The following records were compiled from The Sudbury Star, the Ontario Genealogy Society (Sudbury Branch), http://www.ancestry.ca/, on-line databases (e.g. Commonwealth War Graves Commission, Library and Archives Canada, and Veteran’s Affairs Canada) and http://www.canadiangreatwarproject.com/index.asp. Enlisted personnel were born, lived or worked in Copper Cliff, or parents lived in Copper Cliff. Brothers, fathers and sons, and cousins signed up. Some returned to Copper Cliff, some did not. Of the 253 enlisted men and women, twenty-seven were casualties of war. In addition, Finish and Italian residents returned to their respective ‘home countries’ to enlist. Sudbury Star August 5, 1914 100 Austrians (Finlanders) from Copper Cliff to return to the ‘Old Country’; Sudbury Star August 19, 1914 400 Italians have left Copper Cliff to return to the ‘Old Country’. Many soldiers saw intense action at Passchendaele, Ypres and Vimy Ridge. Casualties and wounded resulted from bullet wounds, explosions, trench fever, broken bones, gas poisoning and Spanish influenza. Many spent weeks, months or years in hospital. Two of three serving sons of Mr. and Mrs. Irwin Morrison were killed within a week of each other. Frederick Wallace Morrison was born November 11, 1981 in Brantford, Ontario. His occupation at time of enlistment was chauffeur. Frederick was killed in action in the area of the Somme on September 7, 1916. He was with the 14th Battalion. Frederick was killed in the trenches south-west of Courcelette, there was no record of his burial. His two brothers Will and Joe, of the 51st Battalion were in the same battle. Joseph Nelson Morrison was born March 5, 1896 in Inaverley, Ontario. Joe was an engineer. He died September 16, 1916, succumbing to wounds received in the battle of the Somme. Joe was buried at Puchevillers British Cemetery Somme, France. William Morrison was the lone survivor of three brothers. The Sudbury Star September 27, 1916. 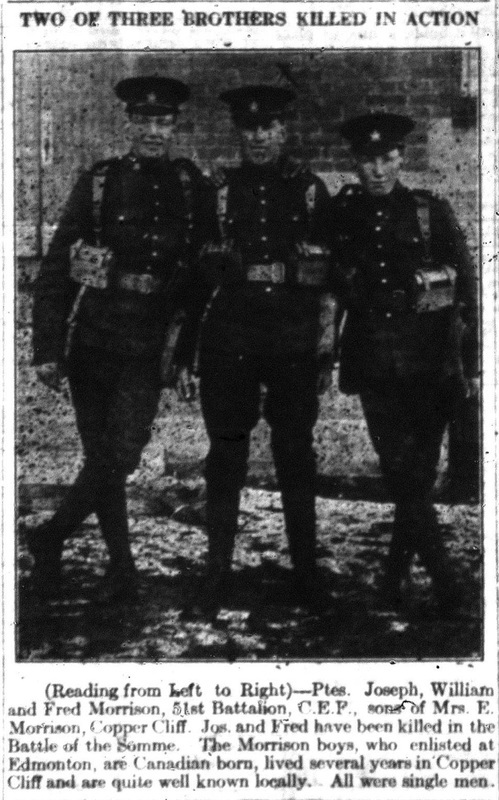 Two of three serving sons of Mrs. Georgina Yandon of Copper Cliff, were casualties of war. Daniel Walker Yandon was born May 15, 1894 in Clarence Ontario. At the time of enlistment, Daniel was a chemist with the Canadian Copper Company. Daniel was with the Canadian Grenadier Guards. He was killed in action November 18, 1916 at the Regina Trench. In the Sudbury Star January 10, 1917 it was reported that "he was reported missing a week ago" July 28, 1917 he was "presumed to have died". Daniel was buried in the Grandcourt Cemetery at Somme, France. John Edwin Yandon was born January 28, 1897 in Hammond Ontario. His trade was bushman. John was killed in action September 30, 1918. He was with the Canadian Infantry 75th Battalion. John was buried in the Cantien Pre Canadian Cemetery at Sailly Nord, France. A third son, William "Willie" Leslie Yandon was born September 7, 1901 in Ottawa, Ontario. At the time of enlistment, Willie was a miner. He was 14 years old. After the war, Willie joined the North West Mounted Police. Daniel Yandon, son of Mrs. Georgina Yandon. George Griffin was killed during a game of baseball when an unexploded shell was picked up and exploded. 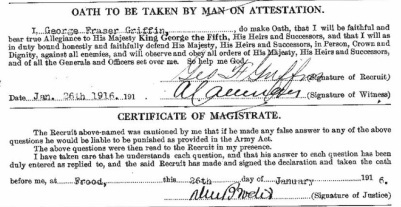 George Fraser Griffin, Sr. and Jr. enlisted, leaving wife and mother Ethel Griffin in Copper Cliff. George Sr. was a miner and served with the 97th Regiment. George Jr. was born June 30, 1897 in Stockbridge, Massachusetts. He also served with the 97th Regiment. On January 26th, 1916, George Jr. volunteered into the 159th (1st Algonquin) Battalion of the Canadian Expeditionary Force. He was given regimental number 648376. George was 18 years old, stood 5 foot 7 inches tall and weighed 140 lbs. He was found to be in good physical health, had hazel eyes, dark complexion and black hair (on his attestation papers his hair colour is mistakenly noted as blue). At the time he was a single student and belonged to the Church of England. George's father, George Sr., soon volunteered to the same unit on March 18th. George Sr. was a 39 year old miner and he presumably volunteered to look out for his oldest son. Both men had previous militia experience with the 97th Regiment. When their training was complete, the 159th left Canada on the S.S. Empress of Britain on October 31st, 1916, and arrived in England on November 1st. George spent a few months in Shoreham, Kent, before the 159th Battalion was then broken up to bolster the strength of the reserve battalions used to reinforce the front line battalions. George was transferred to the 8th Reserve Battalion and arrived in Seaford on February 7th, 1917. He continued his training here until April 21st, when he was transferred to the 4th Canadian Mounted Rifles. He landed in France the next day and arrived for duty at his unit on May 5th. The 4th Canadian Mounted Rifles was staying in shelters in Pylones and the next day the 4th moved up to shelters at La Folie Ridge, all the while under fire from German high explosive shells. This would have been a rude introduction to the war as they took 6 casualties just relieving the 58th Battalion. On May 12th George would have watched as 30 planes took part in an aerial battle overhead in which 4 planes were shot down before they were relieved and moved into the Grange Tunnel to spend the night. The next day they moved to Villers Camp and were held in Divisional reserve. On May 26th, 1917, George was well behind the lines at Toronto Camp. It was 8:30pm and the 4th Canadian Mounted Rifles was enjoying a game of baseball, when another young man, Pte. Clarence McCabe, picked up a blind (unexploded) shell. The shell went off, killing Clarence instantly and George died very shortly afterwards. Seven other men died as a result of that accident, including: Pte. Charles Hartin and Sgt. George Knowles both also died immediately; Pte. Shurley Asselstine, Pte. Arthur Carroll and Pte. Bertie Traviss died the next day at no. 6. Casualty Clearing Station; Pte. 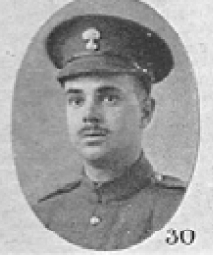 James Dunn survived until May 31st and Pte. Edwin Payne died on June 18th. Ten more were wounded, including: Pte. Thomas Davy and Pte. Morley Gilbert. James Ault, a member of the 15th Battalion was one of a few surviving original members; Jack Follansbee was the sole survivor of machine gun crew of sixteen. Sydney Clarence Smith spent four years in a German Prisoner of War camp in World War I. His son Sydney Percival Smith was shot down in World War II and helped by sympathetic civilians who set him on a complicated and harrowing journey via the famed Comete Line (the Belgian Resistance network). Roy McWhinney Johnson served 8 months in France and was invalided to England as ‘underage’. 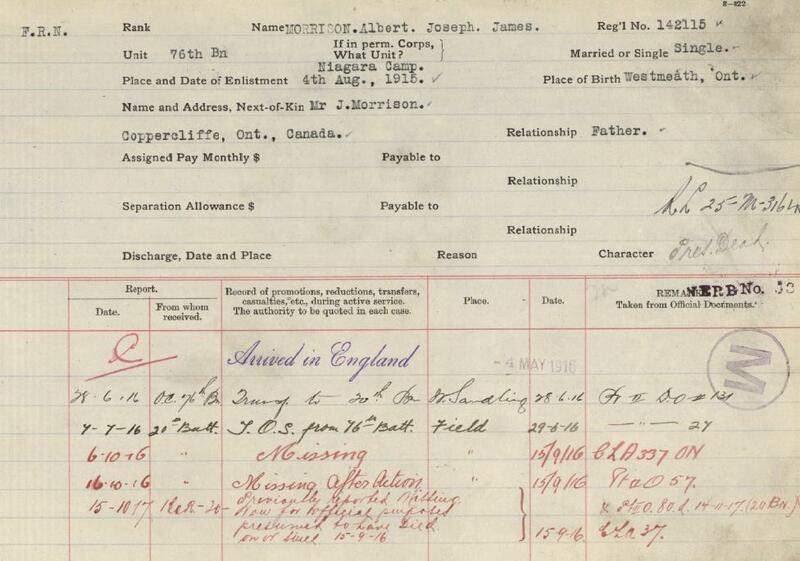 John Albert Lineham was sent home as underage, he saw two years active service in France. Charles Austin Bell was awarded the Military Cross, Herbert ‘Bert’ Knowles, Milton Hanlon and Percy John Jackson (posthumously) received Military Medals. Norman Ewing Leckie received the Distinguished Service Medal (posthumously). Three brought home war brides: Sydney Dawson, Scotty Dingwall and J. Robert Simmons. World War I Copper Cliff. Photo private collection Jason Hyland. Thomas Melville Kilpatrick, Circumstances of Casualty. ​"I Thomas Melville Kilatrick in event of my death or serious injury give P. N, Kilpatrick permission to take my belongings and my ring to Miss Mabel Hyland of Copper Cliff and my watch to Mrs. W. Kilpatrick of Copper Cliff. All monies in my possession or articles useful to P. N. Kilpatrick he can have them. Edgar Jackson is my very best friend..."
Albert Morrison, missing September 10, 1916.